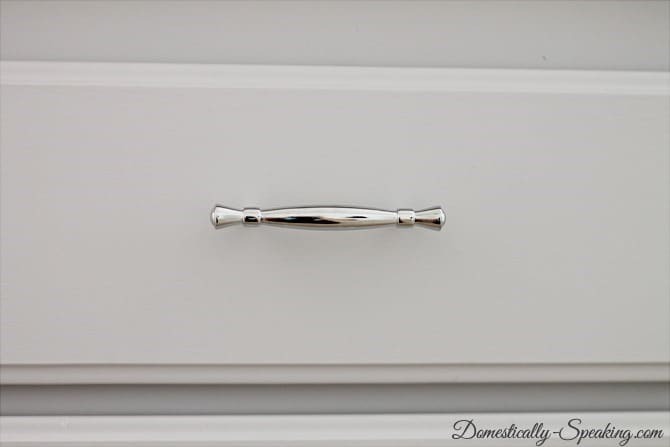 Today I’ve got some tips and tricks to share with you on how I installed the gorgeous cabinet hardware in our master bathroom. 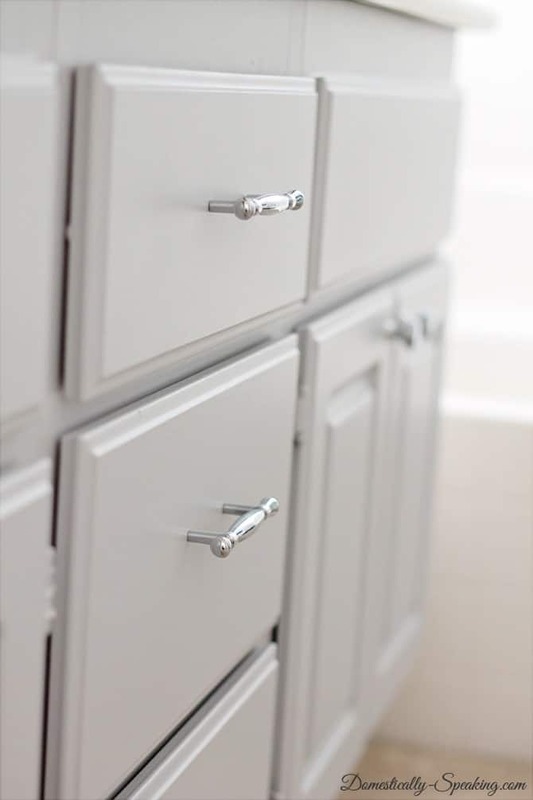 If you missed my post earlier this week on how I painted our boring cabinets this gorgeous gray you can check it out here. Now… adding hardware. Have you seen this nifty tool before? I have to apologize for this photos. I added the hardware last week while the kiddos were at VBS (Vacation Bible School) and the sun was already setting. Back to this cool tool though. I picked it up at Lowes. It’s awesome! You can find it in the aisle with all the hardware. You measure across the top to find the center and gently mark it with your pencil..
Then you place this nifty tool on top, lining up the line on the center of the tool with your pencil mark. Depending on how wide your drawer handles are, you select the appropriate holes. 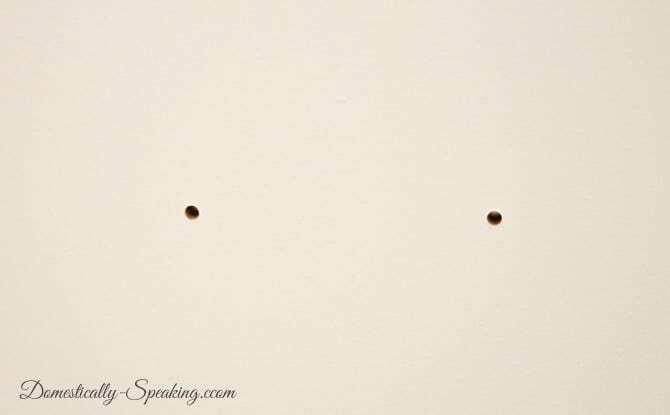 Now one great tip to help you drill a smooth hole is to place a piece of painter’s tape where you will be marking the hole with your pencil. It will also help the drill not to slip when you are starting to drill the hole. 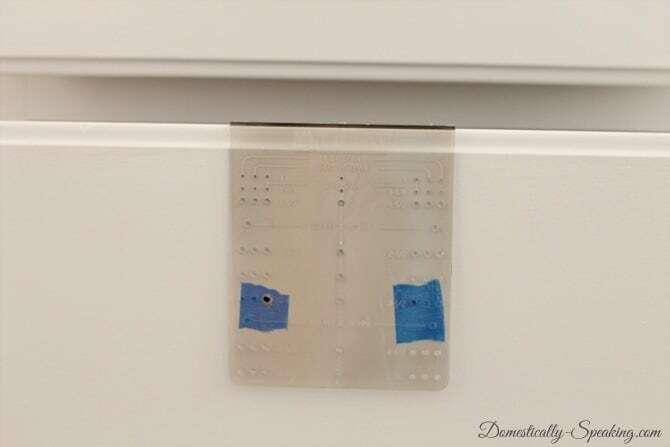 Once you drill the holes you can peel off the painter’s tape to see the crisp, clean holes ready for the hardware. Now the gorgeous hardware I used. I love these knobs! The awesome folks at D. Lawless Hardware hooked me up with these gorgeous things. This Polished Chrome Knob grabbed me the moment I saw it. I love the rings around the top… such classic glam. For the drawers I selected these stunning Polished Chrome Banded Spindle Pulls. Love the shine and shape to these beauties. I love the hardware and the quality is awesome. You know how you can tell the quality of something when you hold it in your hand… yep, I’m impressed. So friends… I hope I gave you some helpful tips if you’re planning to install hardware in the near future. Thanks for stopping by! This looks great! The spindle handles look really nice and the install seems really easy. Thanks for sharing! What a cool tool! I’ll have to go pick one up! Thanks for sharing it this awesome tip! The knobs turned out great. A very beautiful touch to your cabinets. Hi! If I do get around to installing the knobs (since it will be a long process), I most likely will use a level to mark off where the knobs should go, so they will line up. Hi! IYour cabinets look beautiful! 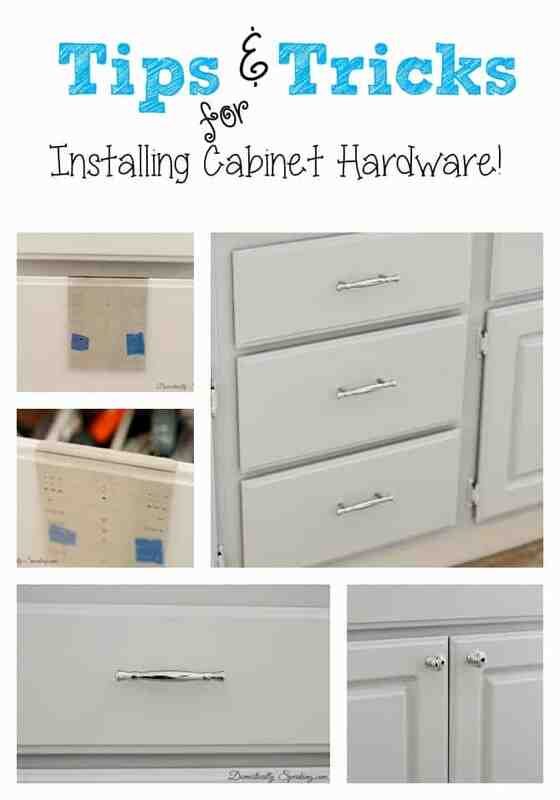 I bought hardware for my kitchen cabinets more than 2 years ago, but haven’t installed them! 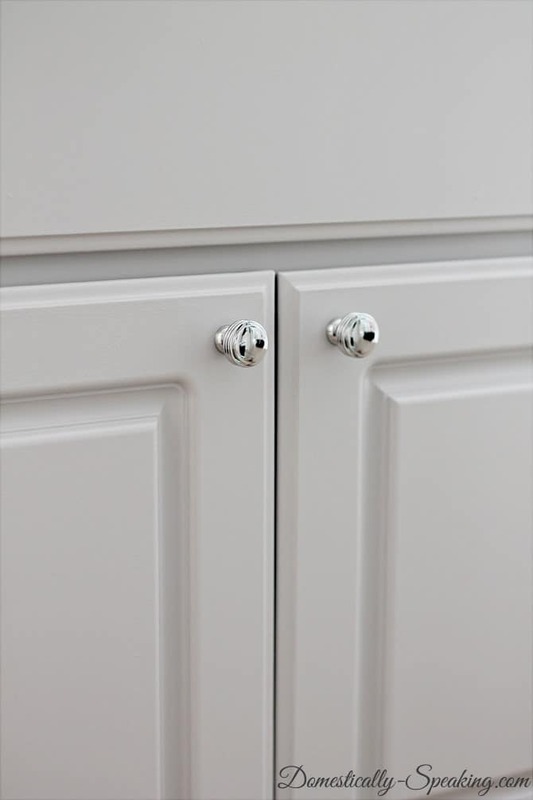 The problem is that I discovered that the builders did not hang all the cabinets at exactly the same leve/heightl, so when I used the template to mark where the knobs should be, I can tell that the knobs will be uneven! I think I am going to have to very carefully determine and mark where the knobs should go (without using the template), so the knobs will all be level. Awesome Derrick! It really is such a time saver! never seen it before – awesome!!! I have to get one.